Toms: Amazing business story and a great business blog. For five years I worked in the footwear industry. My job was managing a couple different footwear catalogs. You got it. Even though catalogs are “dead” there are still millions of people that prefer to shop that way. In fact, for many rural, older consumers, catalogs are the only way to shop. They don’t have the Internet because they physically can’t get in the country or they simply don’t want it. They trust the call center or even mail order more. Anyway, shortly after I started working in the footwear industry in 2007, a new shoe company came on the scene. That company was Toms or TOMS. If you know anything about shoes you probably know that there are some big players in the industry. It’s not easy for newcomers to break into any footwear niche. It takes huge investment and lots of risk. You have to figure out something that’s different and something that the consumer will like. And that all takes investment. In the footwear industry there are these things called lasts. They’re the forms or molds used to manufacture each shoe. Most styles have their own last and that’s not all. Every size needs its own last. And a last can cost tens of thousands of dollars. So if you’re thinking of starting a shoe company come prepared with some cash. Yet despite all the odds against them in 2006, Toms was founded and soon found its footing (sorry, had to) in the shoe industry. Immediately, Toms was different. And it wasn’t just one aspect that was unique. First, Toms had a unique design. They’re casual slip-ons that are versatile. They go with shorts, jeans and khakis. You can wear socks or not wear socks. They make you look laid back and maybe a bit lazy, but people that see them think they’re pretty cool looking for the most part. The design was a winner with the target audience – laid back and mostly young people. Second, Toms has a strong commitment to charity. Many companies provide for charity and it’s great. Toms does it in a different, but relevant way for their company. For every pair sold another pair is given to an impoverished child. Not only is that awesome, but it’s easy to understand. One for one. Everybody gets it. There are no hoops to jump through. No games to play. No forms to fill out. Buy a pair and a pair is given to a child. As far as simplicity goes, Toms has it in design too. The classic Toms only needed a single last per size to create in my estimation. All the classics were the same except for color and material. The company could make one pair of shoes yet have tons of different styles. Third, Toms are at a great price point. We talked about this all the time in meetings especially after the recession. Manufacturing prices were going up and up. Materials got more expensive and so did labor. It was hard to manufacture a shoe and get it priced under $100. I can’t remember what a pair of Toms cost in 2007, but today they’re $54. That’s a steal in the footwear industry today. And my guess is the product margin is 65-75%. That’s before they give away a pair to a child. So it probably falls closer to 50-55%. That’s what CFOs like to see – simplicity, profit. Today, Toms has branched out to include more than just the classic pair of shoes. They have more styles and more products including sunglasses, boots and more. Now let’s get into the fun part about what we do at GBW – blogging. Tom has a great blog that they call Toms Stories. Toms updates the blog multiple times each week. They have a variety of posts including stories about their charity work around the world. They talk about new music. They do interviews. They even share advice for better eating. Each post isn’t much more than a few hundred words. They stick with informative stories that are interesting and enlightening to read. They give action steps for the stories like the healthy eating post. The blog posts usually have great pictures and images – about 2-3 per post. Great categories. Giving and Culture are the biggest in terms of posts. 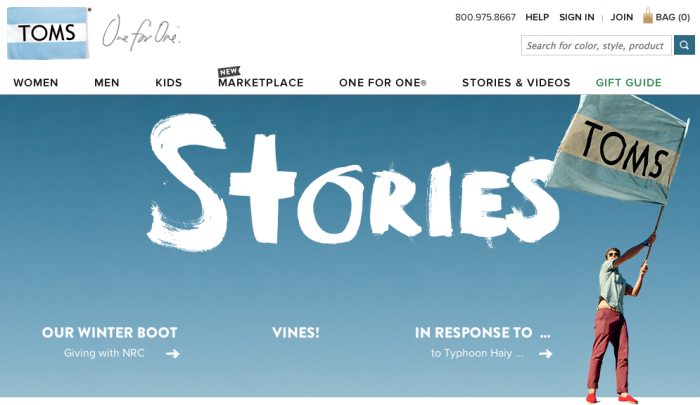 The “stories” concept of the Toms blog is great. They tell the story of how they brought snow to LA. The tie-in is their new boot line. How does this all help Toms sell more shoes? There are multiple levels of marketing going on. First, blogging builds on the brand that Toms has been working to develop since it started. They put language behind the brand. When people read the stories and the posts they get a feel for what this company is about and people want to connect with things like this. We want to be associated with certain things. Some people want to be associated to a fun, laid back company that gives one pair of shoes to children for every pair purchased. Second, there are direct product tie-ins to the stories as with the snow in LA post. People read that and purchase boots. Third, all these posts bring in more traffic to the Toms website. It comes through search and social. It leads to more people discovering Toms, which is the first step in bringing in new customers. In the ecommerce world it’s difficult to sell to someone if they’re not on your website. A blog can make that happen. Toms is not only a great business story, they’re a great blogging story. This is the type of blog that can really inspire other businesses to create something unique and special. I hope it’s given you a few ideas for your business blog. Check out the complete collection of Blog Analysis including KISSmetrics, Hubspot and others.